Art camps are a fun way for the kiddos to get creative! Early release camps include a project and a snack! Drop them off and leave it to us! 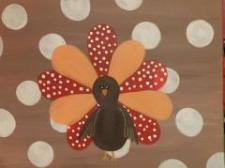 This camp will include a canvas painting with some mixed media feathers.